26 mm 18-ct white gold case with 6 diamonds 0.45 carats, 8.25 mm thick, sapphire crystal, mother of pearl dial set with 33 diamonds 0.06 carats, quartz movement, 18-ct white gold bracelet with double twirl and flexible Scaglie style, each link on bracelet is pave set for a total of 313 diamonds, bracelet diamond weight is 23.60 carats. Water resistant to 100 ft.
26 mm 18-ct white gold case with 6 diamonds 0.45 carats, 8.25 mm thick, sapphire crystal, mother of pearl dial set with 33 diamonds 0.06 carats, quartz movement, 18-ct white gold bracelet with single twirl and flexible Scaglie style, alternating diamond set and polished white gold links, bracelet has 95 diamonds weighing approx. 7.00 carats. Water resistant to 100 ft.
26 mm 18-ct white gold case with 6 diamonds 0.45 carats, 8.25 mm thick, sapphire crystal, mother of pearl dial set with 33 diamonds 0.06 carats, quartz movement, 18-ct white gold bracelet with double twirl and flexible Scaglie style, each link is pave set with diamonds and a single line of agate running through the entire length of the bracelet. 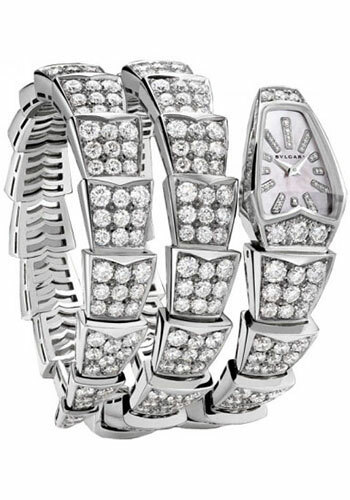 Water resistant to 100 ft.
26mm 18K white gold case set with brilliant cut diamonds, white mother of pearl dial decorated with brilliant-cut diamond-set indexes, quartz movement with hour minute functions, 18K pink gold bracelet set with brilliant cut diamonds.